Adventure seekers can travel across the towering peaks and through the stunning valleys of the Himalayas on a classic Royal Enfield motorbike with a special offer from Extreme Bike Tours. 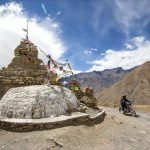 Appealing to the more than one million Australians who ride motorbikes – often in clubs or groups or with mates -Extreme Bike Tours is offering a special, 15 per cent discount per person on their 2019 ‘High Himalaya’ expedition in northern India next July, when booked with three other riders. The special offer is open-ended with no booking deadline. Boasting the world’s highest peaks, the Himalayas offer spectacular vistas and exhilarating riding. Extreme Bike Tours is offering the unique thrill of journeying deep into the Himalayan mountains on a classic Royal Enfield 500cc Bullet motorcycle, which was once manufactured in the UK but is now made in India and tailored to handle the rough and winding roads of the Himalayas. Adventure seekers will have the opportunity to open throttle across the roof of the world as they travel over some of the world’s loftiest mountain passes including the highest motorable road pass on the planet – the cloud-piercing Khardung La in India which soars to 5600m, or 2½ times the height of Australia’s highest mountain, Mt Kosciuszko. 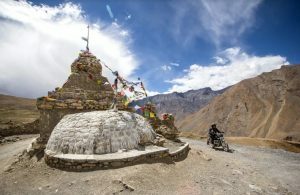 The high altitude, small group rides, which are open to licensed motorcyclists and pillion passengers, offer a very personal experience of the epic Himalayan ranges. The tour begins in New Delhi on July 12, 2019, with a train trip north to Narkanda in the foothills of the Himalayas. From there, the riding begins and guests can experience the adrenaline rush as they travel on narrow, winding roads filled with hair-raising gorges and sky-scraping cliffs. Making their way through the mountains, guests will visit the Lahlung and Dahnkar monasteries, some of the oldest monasteries in the world and immerse themselves in Indo-Tibetan culture as they visit the small hidden mountain villages of Spiti and Komic. Guests will be able to let loose along the long stretching road of the Moray Plains, a dessert surrounded by towering Himalayan peaks, before conquering the mighty Khardung La mountain pass. Beginning on July 12, 2019, the 16-day tour will include 12 days of riding and is open to licensed motorcycle riders from US$3698 per person, including the 15 per cent discount, when booked in a group of four. The fare includes accommodation, meals, fuel and local. Mention the offer when enquiring online with Extreme Bike Tours.